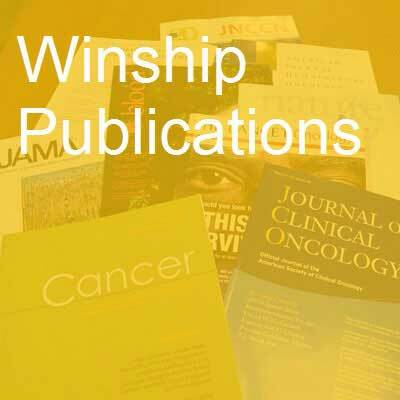 Various first authors and senior authors from Winship Cancer Institute have published 110 studies in major medical and scientific journals in the past month. Comparison of Concurrent Use of Thoracic Radiation With Either Carboplatin-Paclitaxel or Cisplatin-Etoposide for Patients With Stage III Non-Small-Cell Lung Cancer: A Systematic Review. Steuer CE, Behera M, Ernani V, Higgins KA, Saba NF, Shin DM, Pakkala S, Pillai RN, Owonikoko TK, Curran WJ, Belani CP, Khuri FR, Ramalingam SS. JAMA oncology. 2017; 3(8):1120-1129. PubMed PMID: 27978552. Opinion article on lipidomics: Inherent challenges of lipidomic analysis of sphingolipids. Merrill Jr AH, Sullards MC. Biochimica et biophysica acta. 2017; 1862(8):774-776. PubMed PMID: 28161582; PubMed Central PMCID: PMC5476497. Plasma lipoxin A4 and resolvin D1 are not associated with reduced adenoma risk in a randomized trial of aspirin to prevent colon adenomas. Fedirko V, McKeown-Eyssen G, Serhan CN, Barry EL, Sandler RS, Figueiredo JC, Ahnen DJ, Bresalier RS, Robertson DJ, Anderson CW, Baron JA. Molecular carcinogenesis. 2017; 56(8):1977-1983. PubMed PMID: 28218420; PubMed Central PMCID: PMC5496792. Assays for PD-L1 Expression: Do All Roads Lead to Rome? Sica GL, Ramalingam SS. JAMA oncology. 2017; 3(8):1058-1059. PubMed PMID: 28278316. Immune responses and long-term disease recurrence status after telomerase-based dendritic cell immunotherapy in patients with acute myeloid leukemia. Khoury HJ, Collins Jr RH, Blum W, Stiff PS, Elias L, Lebkowski JS, Reddy A, Nishimoto KP, Sen D, Wirth 3rd ED, Case CC, DiPersio JF. Cancer. 2017; 123(16):3061-3072. PubMed PMID: 28411378. Accelerated atherosclerosis development in C57Bl6 mice by overexpressing AAV-mediated PCSK9 and partial carotid ligation. Kumar S, Kang DW, Rezvan A, Jo H. Laboratory investigation; a journal of technical methods and pathology. 2017; 97(8):935-945. PubMed PMID: 28504688; PubMed Central PMCID: PMC5563968. PET Molecular Imaging-Directed Biopsy: A Review. Fei B, Schuster DM. AJR. American journal of roentgenology. 2017; 209(2):255-269. PubMed PMID: 28504563. Association Between Combined TMPRSS2:ERG and PCA3 RNA Urinary Testing and Detection of Aggressive Prostate Cancer. Sanda MG, Feng Z, Howard DH, Tomlins SA, Sokoll LJ, Chan DW, Regan MM, Groskopf J, Chipman J, Patil DH, Salami SS, Scherr DS, Kagan J, Srivastava S, Thompson Jr IM, Siddiqui J, Fan J, Joon AY, Bantis LE, Rubin MA, Chinnayian AM, Wei JT, , Bidair M, Kibel A, Lin DW, Lotan Y, Partin A, Taneja S. JAMA oncology. 2017; 3(8):1085-1093. PubMed PMID: 28520829. Hormone Receptor-Positive Breast Cancer Has a Worse Prognosis in Male Than in Female Patients. Li X, Yang J, Krishnamurti U, Huo L, Ward KC, O'Regan R, Peng L. Clinical breast cancer. 2017; 17(5):356-366. PubMed PMID: 28576631. A better angel of our nature: Hanna Michel "Jean" Khoury, MD (April 24, 1967-May 22, 2017). Khuri FR. Cancer. 2017; 123(16):2998-3002. PubMed PMID: 28621797. Quality in Thoracic Surgery. Fernandez FG. Thoracic surgery clinics. 2017; 27(3):ix-x. PubMed PMID: 28647079. Proteomics Profiling of Exosomes from Primary Mouse Osteoblasts under Proliferation versus Mineralization Conditions and Characterization of Their Uptake into Prostate Cancer Cells. Bilen MA, Pan T, Lee YC, Lin SC, Yu G, Pan J, Hawke D, Pan BF, Vykoukal J, Gray K, Satcher RL, Gallick GE, Yu-Lee LY, Lin SH. Journal of proteome research. 2017; 16(8):2709-2728. PubMed PMID: 28675788. Surgical Margins: The Perspective of Pathology. Magliocca KR. Oral and maxillofacial surgery clinics of North America. 2017; 29(3):367-375. PubMed PMID: 28709535. The role of government and regulation in cancer prevention. Brawley OW. The Lancet. Oncology. 2017; 18(8):e483-e493. PubMed PMID: 28759387. Marijuana Use and Driving Under the Influence among Young Adults: A Socioecological Perspective on Risk Factors. Berg CJ, Daniel CN, Vu M, Li J, Martin K, Le L. Substance use & misuse. 2017; :1-11. PubMed PMID: 28777692. Reasons for Marijuana and Tobacco Co-use Among Young Adults: A Mixed Methods Scale Development Study. Berg CJ, Payne J, Henriksen L, Cavazos-Rehg P, Getachew B, Schauer GL, Haardörfer R. Substance use & misuse. 2017; :1-13. PubMed PMID: 28792283. Radial Scars of the Breast Encountered at Core Biopsy: Review of Histologic, Imaging, and Management Considerations. Cohen MA, Newell MS. AJR. American journal of roentgenology. 2017; :1-10. PubMed PMID: 28813198. Gender Similarities and Differences for e-Health Behaviors Among U.S. Adults. Escoffery C. Telemedicine journal and e-health : the official journal of the American Telemedicine Association. 2017; PubMed PMID: 28813630. Resilience and Biomarkers of Health Risk in Black Smokers and Nonsmokers. Berg CJ, Haardörfer R, McBride CM, Kilaru V, Ressler KJ, Wingo AP, Saba NF, Payne JB, Smith A. Health psychology : official journal of the Division of Health Psychology, American Psychological Association. 2017; PubMed PMID: 28825494. On assessing the effect of breast cancer screening schemes. Brawley OW. Cancer. 2017; PubMed PMID: 28832972. Evidence for ammonium conductance in a mouse thick ascending limb cell line. Lee S, Park J, Li JM, Li K, Choi I. Physiological reports. 2017; 5(16). PubMed PMID: 28830978. Resistance training reduces inflammation and fatigue and improves physical function in older breast cancer survivors. Serra MC, Ryan AS, Ortmeyer HK, Addison O, Goldberg AP. Menopause (New York, N.Y.). 2017; PubMed PMID: 28832427. A pattern-based risk-stratification scheme for salivary gland cytology: A multi-institutional, interobserver variability study to determine applicability. Griffith CC, Schmitt AC, Pantanowitz L, Monaco SE. Cancer. 2017; PubMed PMID: 28834233. Osimertinib As First-Line Treatment of EGFR Mutation-Positive Advanced Non-Small-Cell Lung Cancer. Ramalingam SS, Yang JC, Lee CK, Kurata T, Kim DW, John T, Nogami N, Ohe Y, Mann H, Rukazenkov Y, Ghiorghiu S, Stetson D, Markovets A, Barrett JC, Thress KS, Jänne PA. Journal of clinical oncology : official journal of the American Society of Clinical Oncology. 2017; :JCO2017747576. PubMed PMID: 28841389. Label-free reflectance hyperspectral imaging for tumor margin assessment: a pilot study on surgical specimens of cancer patients. Fei B, Lu G, Wang X, Zhang H, Little JV, Patel MR, Griffith CC, El-Diery MW, Chen AY. Journal of biomedical optics. 2017; 22(8):1-7. PubMed PMID: 28849631. African American patients with breast cancer have worse prognosis than white patients in certain subtypes and stages. Arciero CA, Yang J, Peng L, Ward KC, O'Regan R, Sahin AA, Li X. Breast cancer research and treatment. 2017; PubMed PMID: 28856481. Contemporary Patterns and Survival Outcome of Adjuvant Systemic Therapy for Localized Gastrointestinal Stromal Tumors. Sineshaw HM, Jemal A, Lin CC, McGinnis LS, Ward EM. American journal of clinical oncology. 2017; 40(4):399-404. PubMed PMID: 25599316. Estimating Pertussis Susceptibility Among 0-23-Month-Old Children in the United States: Using National Immunization Survey (NIS) 2013. Childs L, Bednarczyk RA. The Pediatric infectious disease journal. 2017; 36(8):705-711. PubMed PMID: 28060041. Genetically modified rodent models of SCA17. Cui Y, Yang S, Li XJ, Li S. Journal of neuroscience research. 2017; 95(8):1540-1547. PubMed PMID: 27859490; PubMed Central PMCID: PMC5508981. Patient Frailty and Discharge Disposition Following Radical Cystectomy. Pearl JA, Patil D, Filson CP, Arya S, Alemozaffar M, Master VA, Ogan K. Clinical genitourinary cancer. 2017; 15(4):e615-e621. PubMed PMID: 28139446. Beliefs about genetic influences on eating behaviors: Characteristics and associations with weight management confidence. Persky S, Bouhlal S, Goldring MR, McBride CM. Eating behaviors. 2017; 26:93-98. PubMed PMID: 28199907; PubMed Central PMCID: PMC5545160. Descriptive characteristics of colon and rectal cancer recurrence in a Danish population-based study. Holmes AC, Riis AH, Erichsen R, Fedirko V, Ostenfeld EB, Vyberg M, Thorlacius-Ussing O, Lash TL. Acta oncologica (Stockholm, Sweden). 2017; 56(8):1111-1119. PubMed PMID: 28339306. Socioeconomic Status and Non-Fatal Adult Injuries in Selected Atlanta (Georgia USA) Hospitals. Hulland E, Chowdhury R, Sarnat S, Chang HH, Steenland K. Prehospital and disaster medicine. 2017; 32(4):403-413. PubMed PMID: 28359343. Co-amplification of phosphoinositide 3-kinase enhancer A and cyclin-dependent kinase 4 triggers glioblastoma progression. Qi Q, Kang SS, Zhang S, Pham C, Fu H, Brat DJ, Ye K. Oncogene. 2017; 36(32):4562-4572. PubMed PMID: 28368413; PubMed Central PMCID: PMC5552418. The role of postmastectomy radiotherapy in women with pathologic T3N0M0 breast cancer. Cassidy RJ, Liu Y, Kahn ST, Jegadeesh NK, Liu X, Subhedar PD, Arciero CA, Gillespie TW, Torres MA. Cancer. 2017; 123(15):2829-2839. PubMed PMID: 28387923. Gene and Variant Annotation for Mendelian Disorders in the Era of Advanced Sequencing Technologies. Chakravorty S, Hegde M. Annual review of genomics and human genetics. 2017; 18:229-256. PubMed PMID: 28415856. Missed Opportunities for Hepatitis A Vaccination, National Immunization Survey-Child, 2013. Casillas SM, Bednarczyk RA. The Journal of pediatrics. 2017; 187:265-271.e1. PubMed PMID: 28483064. Novel anti-inflammatory agents targeting CXCR4: Design, synthesis, biological evaluation and preliminary pharmacokinetic study. Bai R, Liang Z, Yoon Y, Salgado E, Feng A, Gurbani S, Shim H. European journal of medicinal chemistry. 2017; 136:360-371. PubMed PMID: 28521261; PubMed Central PMCID: PMC5521218. Challenges and opportunities in targeting the CD28/CTLA-4 pathway in transplantation and autoimmunity. Crepeau RL, Ford ML. Expert opinion on biological therapy. 2017; 17(8):1001-1012. PubMed PMID: 28525959. Tethering not required: the glucocorticoid receptor binds directly to activator protein-1 recognition motifs to repress inflammatory genes. Weikum ER, de Vera IMS, Nwachukwu JC, Hudson WH, Nettles KW, Kojetin DJ, Ortlund EA. Nucleic acids research. 2017; 45(14):8596-8608. PubMed PMID: 28591827. BERing the burden of damage: Pathway crosstalk and posttranslational modification of base excision repair proteins regulate DNA damage management. Limpose KL, Corbett AH, Doetsch PW. DNA repair. 2017; 56:51-64. PubMed PMID: 28629773; PubMed Central PMCID: PMC5576989. Daratumumab plus pomalidomide and dexamethasone in relapsed and/or refractory multiple myeloma. Chari A, Suvannasankha A, Fay JW, Arnulf B, Kaufman JL, Ifthikharuddin JJ, Weiss BM, Krishnan A, Lentzsch S, Comenzo R, Wang J, Nottage K, Chiu C, Khokhar NZ, Ahmadi T, Lonial S. Blood. 2017; 130(8):974-981. PubMed PMID: 28637662. Matrix metalloproteinases: their functional role in lung cancer. Merchant N, Nagaraju GP, Rajitha B, Lammata S, Jella KK, Buchwald ZS, Lakka SS, Ali AN. Carcinogenesis. 2017; 38(8):766-780. PubMed PMID: 28637319. Patient-Reported Outcomes in Thoracic Surgery. Khullar OV, Fernandez FG. Thoracic surgery clinics. 2017; 27(3):279-290. PubMed PMID: 28647074. Quality and Cost in Thoracic Surgery. Medbery RL, Force SD. Thoracic surgery clinics. 2017; 27(3):267-277. PubMed PMID: 28647073. Reversibly constraining spliceosome-substrate complexes by engineering disulfide crosslinks. McCarthy P, Garside E, Meschede-Krasa Y, MacMillan A, Pomeranz Krummel D. Methods (San Diego, Calif.). 2017; 125:25-35. PubMed PMID: 28648680. Oxygen-Dependent Globin Coupled Sensor Signaling Modulates Motility and Virulence of the Plant Pathogen Pectobacterium carotovorum. Burns JL, Jariwala PB, Rivera S, Fontaine BM, Briggs L, Weinert EE. ACS chemical biology. 2017; 12(8):2070-2077. PubMed PMID: 28612602. Asparagine endopeptidase cleaves α-synuclein and mediates pathologic activities in Parkinson's disease. Kang SS, Liu X, Ahn EH, Zhang Z, He L, Iuvone PM, Duong DM, Seyfried NT, Benskey MJ, Manfredsson FP, Jin L, Sun YE, Wang JZ, Ye K. Nature structural & molecular biology. 2017; 24(8):632-642. PubMed PMID: 28671665. Comprehensive profiling of H-Ras signaling in angiosarcoma endothelium. da Costa A, Bonner M, Arbiser JL. Clinical and experimental dermatology. 2017; 42(6):645-647. PubMed PMID: 28691211. Adiponectin: Its role in obesity-associated colon and prostate cancers. Muppala S, Konduru SKP, Merchant N, Ramsoondar J, Rampersad CK, Rajitha B, Mukund V, Kancherla J, Hammond A, Barik TK, Mannarapu M, Alam A, Basha R, Bramhachari PV, Verma D, Sushma PS, Pattnaik S, Nagaraju GP. Critical reviews in oncology/hematology. 2017; 116:125-133. PubMed PMID: 28693794. Evaluation of the Surgical Margin: An Interdisciplinary Approach. Lubek JE, Magliocca KR. Oral and maxillofacial surgery clinics of North America. 2017; 29(3):xiii. PubMed PMID: 28709538. Laparoscopic Approach for Treatment of Symptomatic Intra-Pericardial Cyst. Chihara RK, Force SD. The Annals of thoracic surgery. 2017; 104(2):e137-e138. PubMed PMID: 28734435. Overcoming acquired resistance to AZD9291, a third generation EGFR inhibitor, through modulation of MEK/ERK-dependent Bim and Mcl-1 degradation. Shi P, Oh YT, Deng L, Zhang G, Qian G, Zhang S, Ren H, Wu G, Legendre B, Anderson E, Ramalingam SS, Owonikoko TK, Chen M, Sun SY. Clinical cancer research : an official journal of the American Association for Cancer Research. 2017; PubMed PMID: 28765329. Murine gammaherpesvirus M2 antigen modulates splenic B cell activation and terminal differentiation in vivo. Terrell S, Speck SH. PLoS pathogens. 2017; 13(8):e1006543. PubMed PMID: 28767707. Cutting Edge: 2B4-Mediated Coinhibition of CD4(+) T Cells Underlies Mortality in Experimental Sepsis. Chen CW, Mittal R, Klingensmith NJ, Burd EM, Terhorst C, Martin GS, Coopersmith CM, Ford ML. Journal of immunology (Baltimore, Md. : 1950). 2017; PubMed PMID: 28768726. A Minimally Invasive Approach for Inguinal Lymphadenectomy in Melanoma and Genitourinary Malignancy: Long-Term Outcomes in an Attempted Randomized Control Trial. Postlewait LM, Farley CR, Diller ML, Martin B, Hart Squires 3rd M, Russell MC, Rizzo M, Ogan K, Master V, Delman K. Annals of surgical oncology. 2017; PubMed PMID: 28770482. Automated RNA In Situ Hybridization for 18 High Risk Human Papilloma Viruses in Squamous Cell Carcinoma of the Head and Neck: Comparison With p16 Immunohistochemistry. Drumheller B, Cohen C, Lawson D, Siddiqui MT. Applied immunohistochemistry & molecular morphology : AIMM. 2017; PubMed PMID: 28777152. The relationship between lymphangion chain length and maximum pressure generation established through in vivo imaging and computational modeling. Razavi M, Nelson TS, Nepiyushchikh Z, Gleason Jr RL, Dixon JB. American journal of physiology. Heart and circulatory physiology. 2017; :ajpheart.00003.2017. PubMed PMID: 28778909. Comparative Cost Analysis: Teleurology Versus Conventional Face-to-Face Clinics. Zholudev V, Safir IJ, Issa IM, Painter MN, Petros JA, Filson CP, Issa MM. Urology. 2017; PubMed PMID: 28780298. Myeloablative busulfan/cytoxan conditioning versus reduced-intensity fludarabine/melphalan conditioning for allogeneic hematopoietic stem cell transplant in patients with acute myelogenous leukemia. Dhere V, Edelman S, Waller EK, Langston A, Graiser M, Connolly EC, Switchenko JM, Esiashvili N, Khan MK. Leukemia & lymphoma. 2017; :1-7. PubMed PMID: 28782395. The Conserved, Disease-Associated RNA Binding Protein dNab2 Interacts with the Fragile X Protein Ortholog in Drosophila Neurons. Bienkowski RS, Banerjee A, Rounds JC, Rha J, Omotade OF, Gross C, Morris KJ, Leung SW, Pak C, Jones SK, Santoro MR, Warren ST, Zheng JQ, Bassell GJ, Corbett AH, Moberg KH. Cell reports. 2017; 20(6):1372-1384. PubMed PMID: 28793261. RNA In Situ Hybridization for Epstein-Barr Virus and Cytomegalovirus: Comparison With In Situ Hybridization and Immunohistochemistry. Roe CJ, Siddiqui MT, Lawson D, Cohen C. Applied immunohistochemistry & molecular morphology : AIMM. 2017; PubMed PMID: 28800011. CYP2C19*2 and CYP2C19*17 variants and effect of tamoxifen on breast cancer recurrence: Analysis of the International Tamoxifen Pharmacogenomics Consortium dataset. Damkier P, Kjærsgaard A, Barker KA, Cronin-Fenton D, Crawford A, Hellberg Y, Janssen EAM, Langefeld C, Ahern TP, Lash TL. Scientific reports. 2017; 7(1):7727. PubMed PMID: 28798474; PubMed Central PMCID: PMC5552748. Surveillance imaging in mantle cell lymphoma in first remission lacks clinical utility. Guidot DM, Switchenko JM, Nastoupil LJ, Koff JL, Blum KA, Maly J, Flowers CR, Cohen JB. Leukemia & lymphoma. 2017; :1-8. PubMed PMID: 28797213. The proteasome deubiquitinase inhibitor b-AP15 enhances DR5 activation-induced apoptosis through stabilizing DR5. Oh YT, Deng L, Deng J, Sun SY. Scientific reports. 2017; 7(1):8027. PubMed PMID: 28808321; PubMed Central PMCID: PMC5556018. pH-Sensitive metal-free carbon monoxide prodrugs with tunable and predictable release rates. Ji X, De La Cruz LKC, Pan Z, Chittavong V, Wang B. Chemical communications (Cambridge, England). 2017; PubMed PMID: 28809970. Paraneoplastic Thrombocytopenia Cured With Nephrectomy and Vena Cava Thrombectomy: Concurrent Hematology and Oncology Management Conundrums. Melnick KR, Chang C, Antun A, Maithel SK, Master VA. Journal of oncology practice. 2017; :JOP2017024091. PubMed PMID: 28809603. The Role of Anthracycline and Comprehensive Geriatric Assessment for Elderly Patients with Diffuse Large B-cell Lymphoma. Lin RJ, Behera M, Diefenbach CS, Flowers CR. Blood. 2017; PubMed PMID: 28814386. A Phase 1 and 2 study of Filanesib alone and in combination with low-dose dexamethasone in relapsed/refractory multiple myeloma. Shah JJ, Kaufman JL, Zonder JA, Cohen AD, Bensinger WI, Hilder BW, Rush SA, Walker DH, Tunquist BJ, Litwiler KS, Ptaszynski M, Orlowski RZ, Lonial S. Cancer. 2017; PubMed PMID: 28817190. Retinopathy and optic atrophy: Expanding the phenotypic spectrum of pathogenic variants in the AARS2 gene. Peragallo JH, Keller S, van der Knaap MS, Soares BP, Shankar SP. Ophthalmic genetics. 2017; :1-4. PubMed PMID: 28820624. Blockade of Asparagine Endopeptidase Inhibits Cancer Metastasis. Qi Q, Obianyo O, Du Y, Fu H, Li S, Ye K. Journal of medicinal chemistry. 2017; PubMed PMID: 28820254. Novel in vivo and in vitro techniques to image and model the cerebral vasculature in sickle cell disease. Buckley EM, Platt MO, Lam WA. Blood cells, molecules & diseases. 2017; PubMed PMID: 28822622. Luria-Delbrück, revisited: the classic experiment does not rule out Lamarckian evolution. Holmes CM, Ghafari M, Abbas A, Saravanan V, Nemenman I. Physical biology. 2017; 14(5):055004. PubMed PMID: 28825411. Uveal Melanoma Nuclear BRCA1-Associated Protein-1 Immunoreactivity Is an Indicator of Metastasis. Szalai E, Wells JR, Ward L, Grossniklaus HE. Ophthalmology. 2017; PubMed PMID: 28823399. Brainstem dose is associated with patient-reported acute fatigue in head and neck cancer radiation therapy. Ferris MJ, Zhong J, Switchenko JM, Higgins KA, Cassidy 3rd RJ, McDonald MW, Eaton BR, Patel KR, Steuer CE, Baddour Jr HM, Miller AH, Bruner DW, Xiao C, Beitler JJ. Radiotherapy and oncology : journal of the European Society for Therapeutic Radiology and Oncology. 2017; PubMed PMID: 28826628. Exposure to Violence Accelerates Epigenetic Aging in Children. Jovanovic T, Vance LA, Cross D, Knight AK, Kilaru V, Michopoulos V, Klengel T, Smith AK. Scientific reports. 2017; 7(1):8962. PubMed PMID: 28827677. Delta-Secretase Phosphorylation by SRPK2 Enhances Its Enzymatic Activity, Provoking Pathogenesis in Alzheimer's Disease. Wang ZH, Liu P, Liu X, Manfredsson FP, Sandoval IM, Yu SP, Wang JZ, Ye K. Molecular cell. 2017; PubMed PMID: 28826672. Cognitive Impairment and Overall Survival in Frail Surgical Patients. Makhani SS, Kim FY, Liu Y, Ye Z, Li JL, Revenig LM, Vaughan CP, Johnson 2nd TM, García PS, Ogan K, Master VA. Journal of the American College of Surgeons. 2017; PubMed PMID: 28826805. Regression of Diffuse B-cell Lymphoma of the Leg with Intralesional Gentian Violet. Rao S, Morris R, Rice ZP, Arbiser JL. Experimental dermatology. 2017; PubMed PMID: 28833549. Nitric oxide stimulates cellular degradation of human CYP51A1, the highly conserved lanosterol 14α-demethylase. Park JW, Byrd A, Lee CM, Morgan ET. The Biochemical journal. 2017; PubMed PMID: 28830911. Inhibition of p70S6K does not mimic the enhancement of Akt phosphorylation by rapamycin. Wang X, Yue P, Tao H, Sun SY. Heliyon. 2017; 3(8):e00378. PubMed PMID: 28831455; PubMed Central PMCID: PMC5552102. SAMHD1 Promotes DNA End Resection to Facilitate DNA Repair by Homologous Recombination. Daddacha W, Koyen AE, Bastien AJ, Head PE, Dhere VR, Nabeta GN, Connolly EC, Werner E, Madden MZ, Daly MB, Minten EV, Whelan DR, Schlafstein AJ, Zhang H, Anand R, Doronio C, Withers AE, Shepard C, Sundaram RK, Deng X, Dynan WS, Wang Y, Bindra RS, Cejka P, Rothenberg E, Doetsch PW, Kim B, Yu DS. Cell reports. 2017; 20(8):1921-1935. PubMed PMID: 28834754. A Combined Learning Algorithm for Prostate Segmentation on 3D CT Images. Ma L, Guo R, Zhang G, Schuster DS, Fei B. Medical physics. 2017; PubMed PMID: 28834585. The risk of preterm birth and growth restriction in pregnancy after cancer. Hartnett KP, Ward KC, Kramer MR, Lash TL, Mertens AC, Spencer JB, Fothergill A, Howards PP. International journal of cancer. 2017; PubMed PMID: 28836277. Development of GLUT4-selective antagonists for multiple myeloma therapy. Wei C, Bajpai R, Sharma H, Heitmeier M, Jain AD, Matulis SM, Nooka AK, Mishra RK, Hruz PW, Schiltz GE, Shanmugam M. European journal of medicinal chemistry. 2017; 139:573-586. PubMed PMID: 28837922. Esterase-sensitive sulfur dioxide prodrugs inspired by modified Julia olefination. Wang W, Wang B. Chemical communications (Cambridge, England). 2017; PubMed PMID: 28840924. Inhibiting heat shock protein 90 and the ubiquitin-proteasome pathway impairs metabolic homeostasis and leads to cell death in human pancreatic cancer cells. Belalcazar A, Shaib WL, Farren MR, Zhang C, Chen Z, Yang L, Lesinski GB, El-Rayes BF, Nagaraju GP. Cancer. 2017; PubMed PMID: 28841232. Differential HspBP1 expression accounts for the greater vulnerability of neurons than astrocytes to misfolded proteins. Zhao T, Hong Y, Yin P, Li S, Li XJ. Proceedings of the National Academy of Sciences of the United States of America. 2017; PubMed PMID: 28847953. Adenosquamous Carcinoma of the Esophagus: An NCDB-Based Investigation on Comparative Features and Overall Survival in a Rare Tumor. Evans M, Liu Y, Chen C, Steuer C, Cassidy Iii R, Landry J, Higgins K, Beitler JJ, Willingham F, Owonikoko TK, Ramalingam SS, Shin DM, Jegadeesh NK, El-Rayes B, Fernandez F, Krasinskas AM, Gillespie T, Saba NF. Oncology. 2017; PubMed PMID: 28848104. Obesity, physical activity, and breast cancer survival among older breast cancer survivors in the Cancer Prevention Study-II Nutrition Cohort. Maliniak ML, Patel AV, McCullough ML, Campbell PT, Leach CR, Gapstur SM, Gaudet MM. Breast cancer research and treatment. 2017; PubMed PMID: 28856470. Testing Two Evolutionary Theories of Human Aging with DNA Methylation Data. Robins C, McRae AF, Powell JE, Wiener HW, Aslibekyan S, Kennedy EM, Absher DM, Arnett DK, Montgomery GW, Visscher PM, Cutler DJ, Conneely KN. Genetics. 2017; PubMed PMID: 28855307.
mHealth Intervention is Effective in Creating Smoke-Free Homes for Newborns: A Randomized Controlled Trial Study in China. Yu S, Duan Z, Redmon PB, Eriksen MP, Koplan JP, Huang C. Scientific reports. 2017; 7(1):9276. PubMed PMID: 28860461. Ambient Air Pollution and Cancer Mortality in the Cancer Prevention Study II. Turner MC, Krewski D, Diver WR, Pope 3rd CA, Burnett RT, Jerrett M, Marshall JD, Gapstur SM. Environmental health perspectives. 2017; 125(8):087013. PubMed PMID: 28886601. Factors affecting workforce participation and healthy worker biases in U.S. women and men. Johnson CY, Rocheleau CM, Lawson CC, Grajewski B, Howards PP. Annals of epidemiology. 2017; PubMed PMID: 28890283.